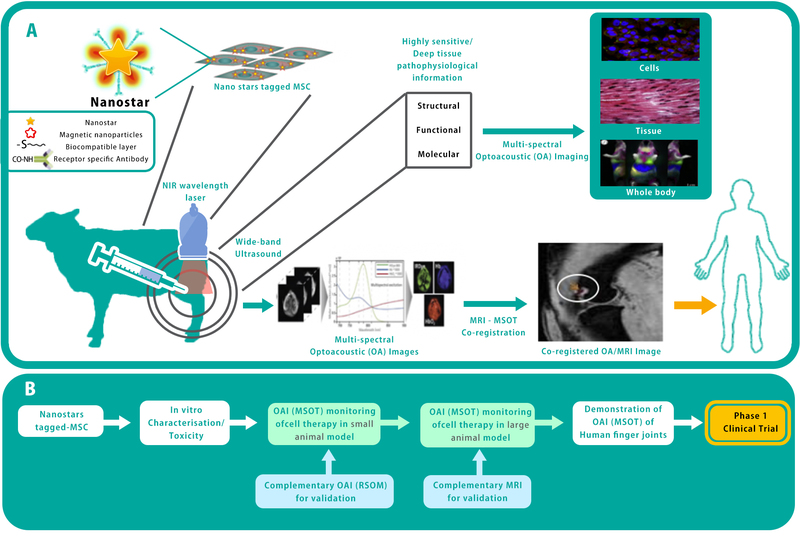 Photo-acoustic imaging (PAI) is an exciting imaging modality, with unique capabilities that are just beginning to be applied in the clinic. It is held back by its limited operating depth beneath the skin. 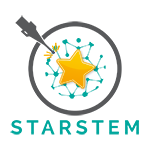 STARSTEM nanostars have the potential to greatly enhance the technology, by increasing its useful depth. Recently published studies using PAI indicate that nanoparticle-tagged cells might be detectable to a depth of up to 4 cm in the human body, based on detection limits of other contrast agents. PAI is non-invasive and non-traumatic. For regenerative medicine, this means that the same animal model can be treated and tracked over multiple images, or indeed in real time. This will enable researchers to capture an unprecedented level of detail about how stem cells behave and how they lead to healing over time. An important novelty in STARSTEM is the use of a NUIG-patented approach to objective (quantitative) measurement of different substances detected using PAI. This technique enables us not only to detect the presence of a substance, but the amount of that substance. This is particularly useful when measuring oxygenated blood versus non-oxygenated blood, because blood oxygen is a key hallmark of healing. A key question for regenerative medicine is the nature of the therapeutic agent – do stem cells lead to healing directly, or do they ‘communicate’ with the body via sub-cellular particles, and trigger healing ‘at a distance’? Exosomes (extracellular vesicles) have been identified as a likely therapeutic agent. STARSTEM will carry out two parallel sets of studies, once with stem cells and the other with exosomes, to see if exosomes are as effective as stem cells in treating arthritis and if they act in the same way (have the same mechanism of action). In addition to PAI, STARSTEM will also further develop NUIG’s novel nano-sensitive optical coherence tomography (nsOCT) imaging modality. This is capable of detecting changes in cell shape at the nanometre scale, with a relatively large (1mm x 1mm) field of view. We see STARSTEM-enhanced PAI as being just one of a suite of imaging modalities in a well-equipped hospital, alongside MRI, XRAY, ultrasound, PET scans, etc. Advanced MRI is a particularly good fit – it offers greater depth than PAI and excellent resolution, particularly when the nanostars are conjugated with tiny magnetic particles (SPIONs), to enhance MRI signal. STARSTEM will develop and demonstrate co-registration software that combines PAI and MRI data to provide excellent images. While we focus on stem cells and exosomes, the STARSTEM technology has great promise for use in other cell therapies, enabling us to track, for example CAR T cells (used in novel cancer therapies), Natural Killer Cells (another important new cancer therapeutic). Nanostars could also be used to tag nanocapsules (tiny spheres of alginate, chitosan or other materials) containing genetic payloads or other forms of biologic therapy.